Born in 1935, the young John Onslow was evacuated from Croydon to Devon in 1940, during the Second World War. 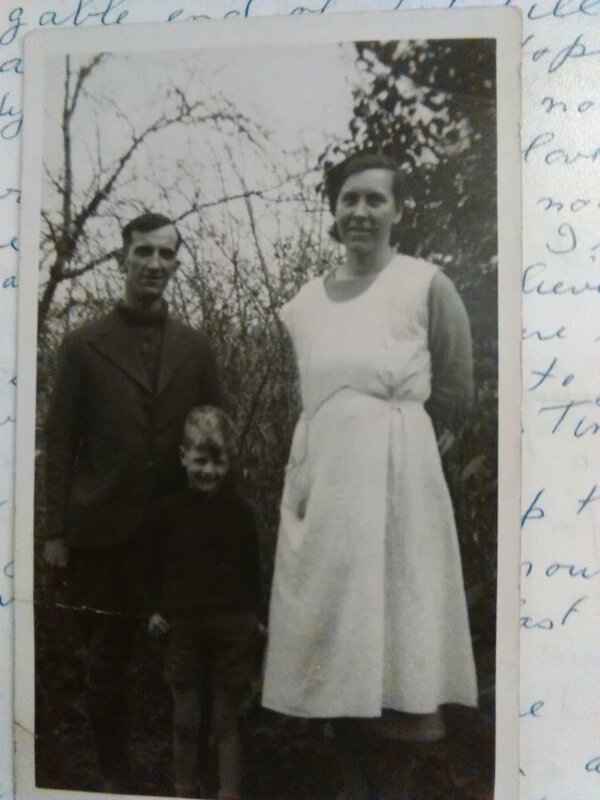 The photograph shows him with his host family, Mr. and Mrs. Ridd. Gwen and Harold Ridd had no children of their own and were by then running a business from Hume's Farm in Bradiford. John went to school in Pilton during his stay. Gwen (née Boyles) was born at no. 1 Bradiford in 1904, and the family moved to the farm around 1905/6. Her father, Jim Boyles, worked as a butcher at 1 and 2 Butchers’ Row in Barnstaple. When he gave up, Gwen’s brother, Bert, took over the shop. Gwen’s husband had been a cabinet maker for Shapland and Petter, but subsequently started up a dairy business with her at the farm. Gwen Chamings died in 1976, and Arthur sold up the farm two years later. John Onslow, now living in Dorset, still visits Barnstaple from time to time. Many thanks to John for contributing this photograph.